Why do we call them “Hit and Run’s”? We’ll leave Sowerby Bridge around 6.00 am and be on the trail by 8.30 am, with the intention of summitting before 12.00 to avoid the inevitable queue at the Trig point and Lunch on the banks of Lyn Lydaw with Snowdon as our back drop . Finish the hike off and be back in the Hogshead for a well earned glass of Lemonade for 7.00pm. Who is it suitable for ? Anyone with the desire to do it. 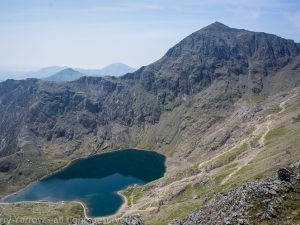 I’ve led teams up Snowdon for 20 odd years and not had anyone fail to reach the summit. What do i need to bring ? A waterproof daysack or one with an inbuilt rain cover, NO JEANS. Good, broken in boots. DO NOT TURN UP WITH NEW BOOTS YOUVE NEVER WORN BEFORE. Flask with hot drink, packed lunch and energy foods, full waterproof kit – top and bottoms, sun cream and glasses, gloves, hat, change of socks and a small towel are advisable. If you’re prone to blisters, Compeed is advisable too . Change of clothes and footwear for the journey home . We do see and have experienced all four seasons in one day, so we prepare for the worst.